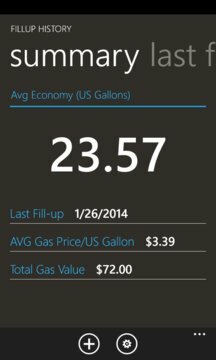 Fill Up History is the App which will allow you to monitor the fuel consumption of your vehicle. 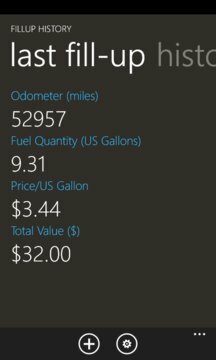 The purpose of this app is to have a simple and effective way of recording Fill-ups and track your average consumption. - Improved readability on Light Windows Phone theme. - Added settings page to customize vehicle Brand and Model. - Improved page that appears when the app is opened but a fillup is not inserted.